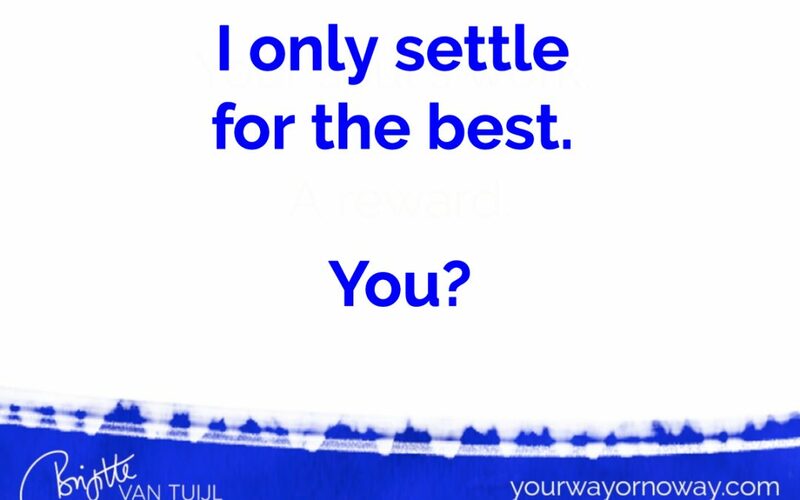 I only settle for the best. You? In ancient times, a colleague once asked me what kind of partner I was looking for. “I know exactly what my ideal partner is like,“I told her, and started rattling off my list of qualities and characteristics he should have; how I wanted him to be in the relationship; etc. I was COMPLETELY flabbergasted by that question. She didn’t know how to react to that. And I could tell she believed I’d NEVER find someone ‘cause I was too picky and demanding. I met Arjen about a year or so later, and we just celebrated our 17,5-year anniversary – still super happy and in love. It truly never occurred to me that maybe, I was asking for too much. And that maybe, I had to water down my request if I ever wanted to be in a relationship again. But I’m not THAT certain about getting EXACTLY what I want in EVERY area of my life. I realized that suddenly this morning, when I wondered how come I hadn’t manifested something yet. I haven’t made it a non-negotiable yet. I’m settling for less than what I TRULY want. I SAY I want this, I KNOW I want this, and I THINK I want this….but part of me doesn’t believe I can truly have it. I settle for less in my mind the moment I feel into this desire. I REALLY want this! Yes, I do. It truly matters to me. I can feel it so clearly. So deeply. But I’m not attached or anything, I mean, if I don’t get it that’s fine, too. A bit less is still super cool! And maybe getting the ENTIRE thing is a bit too much anyway. I don’t really NEED that much. A bit less will still be fine. Yeah. Of course it is. That might be the best I can get anyway, so let’s not get my hopes up too high, and just be happy with whatever I can get, right? ‘Cause I mean, that’s still more than nothing. This is the EXACT opposite of how I felt years ago about a new partner. I was VERY clear on what I wanted. And I was VERY clear that it was that – or nothing at all. There are many more areas in my business & life where I don’t settle for anything less than what I TRULY want. And – no coincidence! – I always get exactly what I want in those areas. Sometimes it’s just so in one go, other times it takes longer or it takes more effort. I get it EXACTLY so. And at no point at any time the thought of NOT getting it crosses my mind. …besides a couple of areas where I settle for less. I’ll dive into this some more. Explore my mindset, expectations & beliefs in the areas where I do NOT settle, and see how I can translate that mindset to the areas where I still settle today. I already know most of it, ‘cause it’s not the first time I’ve explored the whole settling versus it’s my way or the highway-theme. But there’s always a next level to unfold, a deeper layer to sink into, and more space and clarity to open up. It’s time to take a closer look at where I (still) settle, and move into the next level of not-settling. Where do you (still) settle in your business and life? Where do you accept less than what you TRULY want? Where DO you already get exactly what you want? What’s your mindset, beliefs, expectations, beingness etc. like in those areas? And how can you translate that to the areas where you’re still settling? P.S. : Ready to stop settling for a business that’s not EXACTLY as you truly want it? And to finally create the business & life you TRULY want? Maybe my 1-1 coaching can help with that. You can read all about it here, and apply for a spot if it resonates for 100%. P.P.S. : Is my 1-1 coaching not for you right now? My Divinely Selfish Community might be a better fit for you instead! Want to receive a year long support, inspiration, master classes, my book(s) and other cool stuff on putting YOU first in business and life, so you can make a difference and good money without compromising or selling yourself short?